What is a wire-wound resistor? A wire wound resistor is a resistor where a wire with a high resistivity is wrapped around an insulating core to provide the resistance. Wire wound resistor construction varies widely. The manufacturing and choice of materials used is dependent on the way the resistor will be used in a circuit. All are made by winding a wire around a core. The resistance value is dependent on the resistivity of the wire, the cross section and the length. Since these parameters can be accurately controlled, a high precision can be achieved. For high tolerance requirements, the resistance value is measured to determine exactly the cut to length of the wire. To create a high resistance, the wire diameter needs to be very small and the length very long. Therefore wire wound resistors are mainly produced for lower resistance values. For low power ratings, very thin wire is used. The handling of the wire is for this matter critical. Any damage may sever contact. After winding the wire is well protected from access of moisture to prevent electrolytic corrosion. Next to precision, there are also wire wound resistors with high power rating for 50W or more. These resistors have a quite different construction. Compared to other resistor types as the metal film, the wire diameter is relatively big and therefore more robust. In the following table the properties of the most common alloys are given. For high precision applications like measuring circuits, the difference in material of the resistor wire and the connecting leads can cause a negative effect. At the junction between the materials a change in temperature can cause a small unwanted voltage across the resistor. This is called the thermoelectric effect. Wire wound resistors naturally have some capacitance and inductance. Because of this, they influence the current flow in an alternating current circuit. This effect is usually not wanted. Because of the design principle of the wirewound resistor, which is basically an inductor, these resistors have the worst high frequency properties of all resistor types. 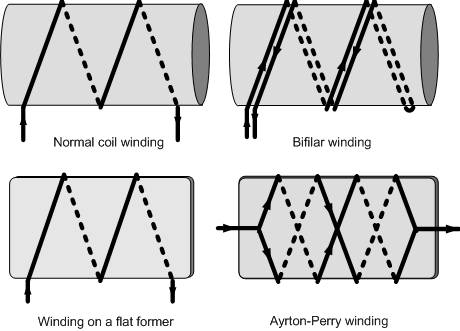 These types of winding are applied for measurement devices and decade banks. The drawback of these methods is the difficulty of the manufacturing process. A bifilar winding is a type of winding where the wire is folded double, and from this double wire a capacitor is made as in the picture below.. This type of winding results in very low self induction, but the parasitic capacity between the wires is large. Another way to reduce the capacity that arises with a bifilar winding is the simple winding on a flat former. The thinner the card, the closer the wires of front and back are together. They cancel each other’s field and thus reduces the inductance. Resistors with Ayrton Perry winding are used for the most demanding circuits. 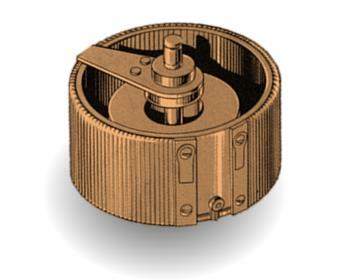 This type of winding is similar to the simple winding on a flat former, but in this case two opposite windings are applied. The wires with opposite direction of current are close together, so that the winding is free of self induction. The intersections are on the same potential to have a minor effect on the capacity. Wire wound resistors can roughly be classified in two types: precision and power. They can be modified for use in current and temperature sensors and potentiometers. These versatile resistors can be used in a wide range of applications. High precision wire wound resistors typically used in precision AF attenuators, measuring bridges and calibration equipment. Typical values for the tolerance of the resistance value is 0.1% or better. The temperature coefficient of resistance lies around 5 ppm/°C, which is considerably better than most metal film resistors (around 25 ppm/°C). The stability is fairly good, with values like 35 ppm change for a year of operation at full power rating. The temperature rise of these resistors is usually below 30°C. Therefore they can be coated by epoxy resin materials.In practice, a designer might decide that a resistor needs to be within ±0.05% of the design value for a particular circuit application. To account for aging, TCR and other parameters, the designer might then specify a tolerance of ±0.01%. This ensures that the resistor stays within the required resistance range over time and varying circuit conditions. Wire wound resistors exist for very high power applications. The range varies from 0.5 watts till more than 1000 watts. Power wirewound resistors can be divided in types according to the coating type. Silicone resins are used for the lowest dissipation levels. They are compact resistors that can withstand temperature rises up to 300°C above the ambient temperature. Another type of coating is vitreous enamel. This traditional coating has good insulating properties at low temperatures, but at full rated temperature the insulation is considerably less. This property makes it less and less common. The maximum working surface temperature is up to 400°C. TCR varies from 75 till 200 ppm/°C. 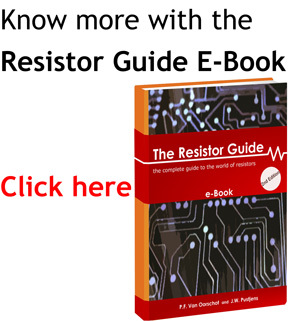 Typical resistance values are in the range from 1Ω til 10 kΩ. The majority of the power wirewound resistors have a ceramic core and a ceramic coating to protect the winding. The ceramic coating combines a high insulation and physical protection with good heat dissipation. Typical power ratings are between 4 and 17 watts. The maximum surface temperature is around 300°C and the TCR varies from 250 till 400 ppm/°C. The resistance values are between 10kΩ and 22kΩ. Usually they are manufactured with leads that allow for vertical or horizontal mounting. For the highest dissipation values the resistor has a aluminum case with fins. These fins give a larger surface area from which to dissipate heat, letting the resistor handle more power without being damaged. These resistors have a ceramic core and a silicone resin coating, encased in an aluminum extrusion. The surface is anodized to maintain a good insulation resistance. These resistors have a typical power rating of 25 to 50 watts. This assumes that the resistor will be mounted on a metal surface, so that the heat can dissipate better. The maximum surface temperature is around 300°C and the TCR is low with around 25 ppm/°C for the ohmic values above 50Ω. Usually the TCR is higher for lower resistance values. Potentiometers are often wire wound resistors. A potentiometer is a resistor that has three terminals. One of these is attached to a movable contact that varies the amount of resistance. Wire wound resistors are suitable as potentiometer, because of the durable construction. Wire wound resistors are often used in circuit breakers or as fuses. To make a fusible resistor, the manufacturer attaches a small spring to one end of the resistor. A small amount of solder will hold this spring in place. If current and heat through the resistor gets high enough, the solder will melt and the spring will pop up and open the circuit. Because of their high power capabilities, wire wound resistors are common in circuit breaker applications. The may be used as components in a large circuit breaker device, or may act as circuit breakers themselves. When fusible wire wound resistors are sold for use in high power applications, they are often labeled as circuit breakers. 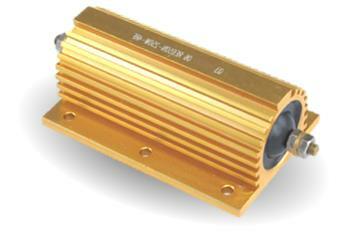 Wire wound resistor potentiometers can be made to offer both high power and high precision. These potentiometers are often used in stereo systems for their precision and in high power applications like transducers and televisions. Wire wound resistors can also be used as temperature sensors. In this case, metal that has a positive temperature coefficient is used. This means that as the temperature of the metal rises, the resistance rises. This varying resistance can be measured and converted back to a temperature value. Enhancing the inductive effect that is natural to wire wound resistors can let these resistors be used as current sensors. Inductive reactance is determined by the inductance of the device and the current flowing through it. Current sensing devices measure the reactance and convert it to a current reading. These are used in situations where a high current condition may occur, and it is desirable to correct it before tripping a breaker. Large cooling water pumps and freezer units are examples of this type of application.